In a year that’s already seen the unlikely return of Faith No More, The Jesus Lizard, Thorr’s Hammer and Goblin, the most surprising reunion is of industrial metal legends Head of David. Back in late 80s/early 90s, the West Midlands outfit ruled the roost, their pummelling Throbbing Gristle meets Suicide meets Sabbath combination setting the blueprint for bands like Godflesh, Fear Factory, Pitchshifter and numerous others. Frontman Stephen R Burroughs, once staunchly opposed to anything in the way of a reunion, finally succumbed, an offer from the folks behind Supersonic Festival too good to pass up and his long-term steadfast refusal eventually transforming into genuine enthusiasm. So was there any particular reason he swore he would ‘never’ do it again after they split in 1991? Since the band’s dissolution, the band members have variously gone on to do other things, musical and otherwise, the most high profile of course being Justin Broadrick’s Godflesh, Jesu and numerous other ventures. Dave Cochrane worked with Broadrick on a number of projects including Jesu, God, Ice and the upcoming Grey Machine, as well as The Courtesy Group and Transitional, while Eric, Sharp and Stephen all but retired from music. “I continued to write” Stephen says. “I’ve done a lot of things you see, but nothing that’s surfaced. The last time I recorded was actually last summer for the Alan Vega tribute, the 10” singles on Black First – that’s the first time I’ve been in the studio for years”. 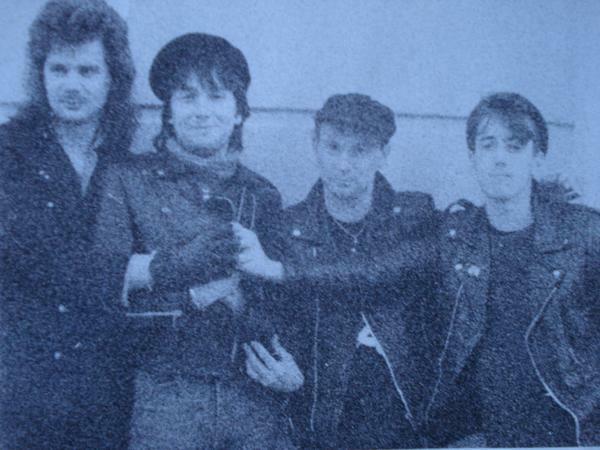 One of the original outfits on the industrial metal scene, the Black Country foursome were operational between 1986 and 1991 with a varying line-up, producing three albums and a handful of EPs on Mute’s Blast First label before calling it quits. Appearing at this year’s Supersonic Festival, which is fast shaping up to be a sort of Dream Comeback Festival this year (see also Thorr’s Hammer and Goblin), 2009 marks the end of an almost two decade hiatus, with the bad appearing in their original 1986 guise. And what about Justin Broadrick? Was he considered for the reunion? So how was it playing these songs for the first time in twenty years? “It was surprisingly good fun actually. It feels very different. The good thing about it is it doesn’t feel like it’s some ‘friends reunited, let’s all be self indulgent and try and live out our past’ kind of thing. It does feel quite relevant because I think with maturity over time, in ourselves, we’ve approached it all differently and it does feel quite fresh and it’s sounding very good. I said initially: let’s rehearse, if it sounds good, if we’ve still got the same sound, we’ll do it. And we plugged in and away we went and it was really quite easy. As I say, it does sound good.” Presumably, though, energy levels aren’t quite the same as when they were all younger? “(laughter) You’re joking! No…that’s a categorical NO, and I certainly don’t shout with the same nervous energy that I used to”. Like so many bands that would eventually prove to be influential, during their active phase Head of David were largely acknowledged only by those in the know, remaining underground while bands like Godflesh, and later on Fear Factory (who covered ‘Dog Day Sunrise’ on 1995’s Demanufacture), took this sound to a wider audience. Stephen, for one, is unperturbed by their lack of tangible popularity the first time round, nor was it ever part of the plan. So with the band revving up for their performance at the upcoming Supersonic Festival in their natural surroundings of Birmingham, UK, the reunited combo are about to make their full comeback, with a swiftly widening plan to resurrect their name for a new (and for that matter old) audience. “The back catalogue should be reissued later this year, hopefully in time for Supersonic, but I’m not sure when that’s gonna happen. As for recording new stuff, it’s now become apparent that we would like to record something – more of a continuation of what we were doing back then and put-the-record-straight kind of record. That’s what we’d like to do. Something with a bit of feeling. So hopefully we will record, but we’ve got Supersonic in mind, and that’s it at the moment. There have been a few offers already to do other things, and there’s a good chance that we’ll do other things. I can only be as vague as that at that moment”.